Pressure rising: are anti-shale gas victories stepping stones? By Nick Meynen and Maxime Combes. Texas based Noble Energy recently became the first company to receive a permit for deep-sea drilling in the Gulf of Mexico since the BP oil spill, but their operations stretch far beyond the US. After finding a new and big gas field off the coast of Israel, they have set their eyes on the seabed right next to the French Rivièra. More specifically, they would like to ‘take a look’ at a layer of gas less than 30 km away from beaches that accommodate millions of bathers, and from the valuable nature reserve The Camargues. But with the BP oil spill fresh in public memory and with an off-shore gas exploration currently in trouble in the North-Sea, they are facing serious opposition. France already became the first country in the world to ban hydraulic fracturing, or fracking, a dangerous drilling technique used in the U.S. by Noble Energy and others to extract gas from shale. As we wrote earlier, Bulgaria has also recently imposed a moratorium on this technique, after mounting public protests. On April 6, President Sarkozy, under heavy pressure from growing civil society mobilization and of course in full re-election mood, went a step further: he compared his opposition to fracking with the decision not to extend the Noble Energy permit for prospection, no matter what technique they would use. Thousands of people who planned to demonstrate against the permit renewal on April 8 celebrated this small victory. As the license has not been extended with a new decree this morning on April 11, the previous permit they had is now invalid. According to Maxime Combes, from ATTAC France, this could be a stepping stone to move from the singular issue of fracking – proven to be too dangerous and already banned – towards a broader campaign to ‘leave the gas and oil in the soil’. Probably a few steps in between will be needed, such as banning fracking worldwide and banning off-shore drilling in fragile places, no matter which technique is used. In his article, Maxime warns that many other permits remain valid, pro-fracking articles are flooding the media and the administration just published a report recommending to evaluate “gaz de schiste” resources in France and to develop scientific tests using fracking to improve techniques. But with Total trying to stop an increasingly dangerous gas leak in the North Sea, the time for a serious public debate in France on oil and gas exploration in general is certainly appropriate. Does the general public know that at least five big oil companies – including giants like Total, Petrobras and Statoil – are now backing a research mission focusing on a layer 11 km deep under the sea surface (which is very deep and dangerous for oil drilling), 200 km from the French coast? They say it is for a variety of research purposes but let us be honest: these companies are probably not in search of dinosaur eggs. So the question in France now is: what will the position of the next French president regarding oil and gas exploration be? Will he or she consider the current period as a short, temporary and localized ‘strategic retreat’ from a long term offensive to grab as much oil and gas from wherever it can be taken at no matter what cost and risk for people and environment? 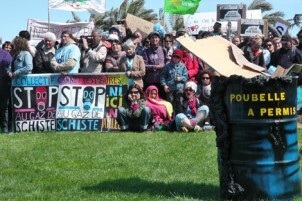 Will the anti-shale gas movement in France grow in support, scope or even both? How will the French public answer this question: are we satisfied with the short-term victory of bashing an American company in full election time – or will we look further? Maxime Combes explains why even an organisation like ATTAC – normally active on financial reform- is so involved in this campaign: “We believe it is no longer possible to separate the financial crisis from the ecological crisis because of the social consequences of both. If ATTAC is involved in this mobilization against fracking, that’s because we think this is useful to change the balance of power and to impose new ways of thinking and new patterns of production and consumption”.